The Volund Gearworks Atlas Cobra Slim came onto my radar after I decided to ditch the traditional leather gun belt in favor of something a little more tolerable on my hips. 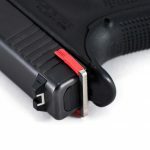 Decidedly done with bruises on my hip bones, I was in the market for something that was flexible but also sturdy enough to handle my EDC – a Glock 19 and spare magazine. Volund Gearworks’ belts seemed to fit that bill. In perusing the copious options on the website, I ultimately decided to try my hand and hips with the Atlas Cobra Slim model in Black/Wolf Gray. The Atlas Cobra Slim is offered in various sizes starting at XS (24-inch to 30-inch waists) and topping out at XXL (44-inch to 50-inch waists). Volund Gearworks recommends that customers don pants they usually wear to conceal, tuck in anything carried in the waistband (i.e. undershirts, girdles, holsters, etc. ), and then measure around the waist. The resulting number is the waist measurement and can be used to determine which size belt to order. After a quick measurement, I found I teetered on the edge of 34-inches with my Glock 19, spare mag, and holsters. According to the size chart, I could sport either a small or medium. Erring on the side of caution, I contacted Volund Gearworks to get their take on which size option would be best. Replying same day, I was told that a small should work just fine. 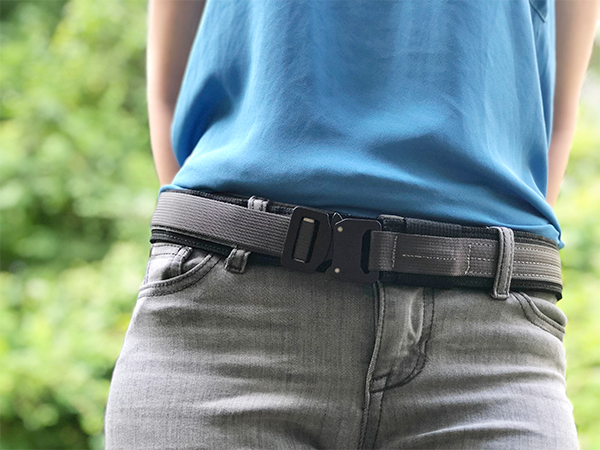 The Atlas Cobra Slim belt arrived on my doorstep just a few days after I placed my order and I immediately set out to test whether it was a worthy concealed carry option. Out of the gate, I was pleasantly surprised by how comfortable the Atlas Cobra is on my hips. The flexible fabric had some give to it and that allowed it to duck around my bony hip area without digging in and bruising me. Even supporting the weight of my Glock 19 and cinched in tight to prevent printing of the gun, the Atlas Cobra Slim didn’t leave me sore at the end of the day. The Atlas Cobra Slim is unique from more traditional style gun belts in that the main fabric slips under the buckle and nestles into a loop keeping it in place. The gray, lighter fabric on top connects to the cobra belt buckle and allows the belt to cinch into place. The tail end of the gray fabric, once tightened, utilizes hook and loop to stay in place so there’s no excess belt flopping around. For those of us who like a clean, everything-in-its-place vibe, this construction is perfect. At no point was I concerned about extra fabric getting in the way of drawing or re-hosltering. Despite earning major brownie points for comfortability, there was still the question of whether the belt could weather the storm of concealment. As a petite carrier, or micro warrior as I like to say, low-profile gear is essential in order for me to flawlessly carry my Glock 19. 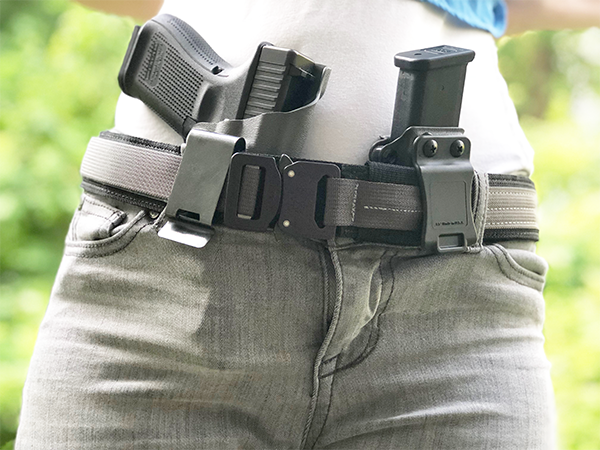 Standing 5’2 at 105-pounds and with AIWB (appendix inside the waistband) as my preferred method of carry, any extra bulk quickly becomes problematic, impacting concealment. In the past, hulking belt buckles have proved to be the bane of my concealed carry existence and have earned their own special place in my bin of discarded gun gear. Would the Atlas Cobra Slim also be relegated to this gun gear black hole? 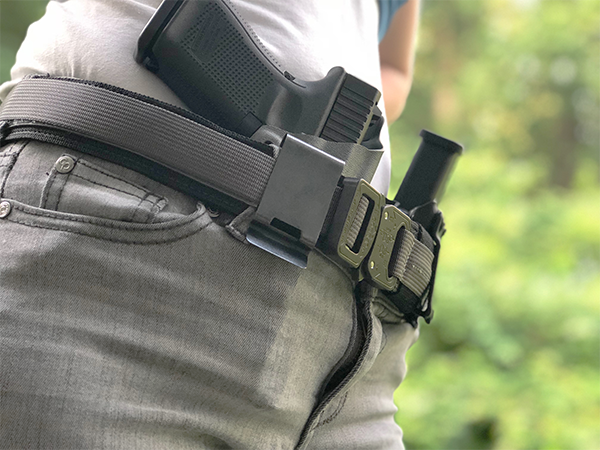 Fortunately, Volund Gearworks took the moniker “slim” seriously, creating a truly low-profile design perfect for concealed carriers of any size. 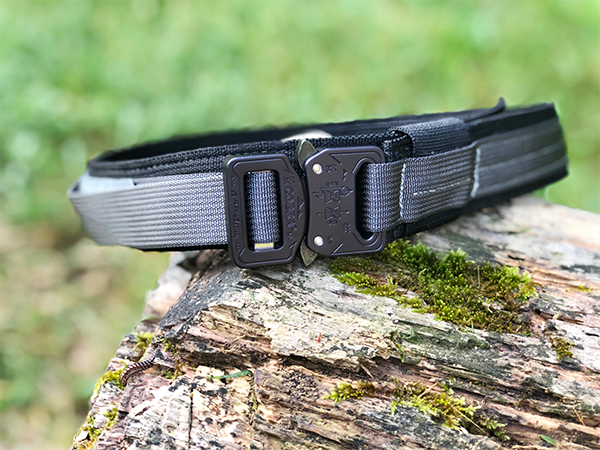 The Slim belt itself ditches the stiff scuba webbing found in other Volund wares, offering a thinner material that slips through belt loops and lies flat against the body. In addition to slimmer overall fabric construction, the belt also incorporates a slender cobra buckle. The cobra buckle was inconspicuous and therefore enabled me to pop on the Glock 19 and spare mag in AIWB without looking like I was smuggling a rogue watermelon under my shirt. The cobra belt buckle, a first for me, came with a slight learning curve. For the first couple of days I struggled to get the cobra buckle on and off; but once I became familiar with it, it became second nature. The Atlas Cobra Slim delivers a durable belt option that, after four months of hard and heavy use, is still going strong. Day after day of mounting various guns and gear to it hasn’t worn it down or stopped me in my concealment journeys. Despite its pricier appearance, retailing for $75, I found the Volund Gearworks Atlas Cobra Slim belt to be worth its heftier price tag. 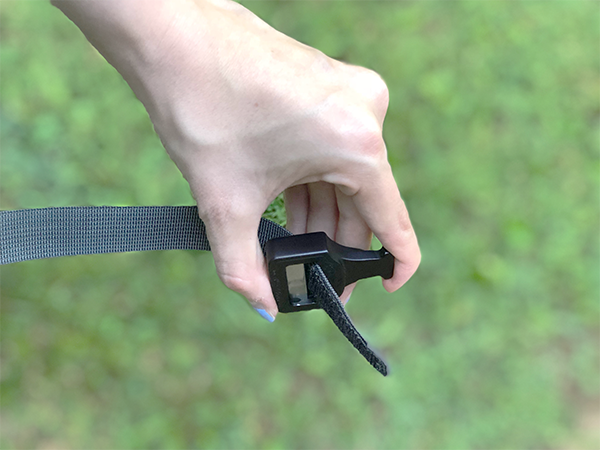 Providing a solid platform for guns and gear to safely and securely mount, the Atlas Cobra Slim belt also adds a layer of comfort ensuring that concealed carriers end their day of concealment just as they started – bruise free. Jacki hails from the hills of Tennessee where she grew up surrounded by guns. She became serious about firearms and, in specific, their role in personal protection in her early twenties and that love affair propelled her into a career as a firearms journalist. She currently holds certifications as a NRA Instructor and TN Concealed Carry Instructor in addition to sporting a black belt in the Korean mixed martial art of Yongmudo. Jacki uses her Bachelor’s Degree in Journalism to funnel her passions of writing, concealed carry and guns into articles designed to help petite micro warriors like herself in their journey towards self protection. Jacki currently resides in her home state of Tennessee — go Vols! — with her two children and a mischievous Corgi.